It’s probably fair to say that Donald Trump was not the first choice for president among the majority of those within the media and entertainment industries. Since his election last month, however, their official industry representatives have wasted little time trying to ingratiate themselves with the incoming administration and to press the industries’ policy agenda. The Association of American Publishers laid it on equally thick. The outreach probably has less to do with a change of heart on the president-elect as with a perceived opportunity to gain the ear of the new White House after eight years in which the Obama Administration was seen as tilting toward technology companies — especially Google — with which copyright owners often view themselves as in a zero-sum struggle over issues related to intellectual property. So intense is the paranoia in some quarters over Google and its influence on the Obama White House, in fact, that it has led some in the copyright industries embrace conspiracy theories, seeing Google’s sinister hand behind everything from the abrupt removal of the Register of Copyrights by the new, Obama-appointed Librarian of Congress to the Justice Department’s recent decision to require 100 percent licensing of songs by ASCAP and BMI. Paranoia aside, though, the copyright industries are probably right to pounce, at least as a political matter. To whatever extent Google and its Silicon Valley cohorts truly worked against the interests of copyright holders the technology industry suddenly finds itself on the defensive in the age of Trump. 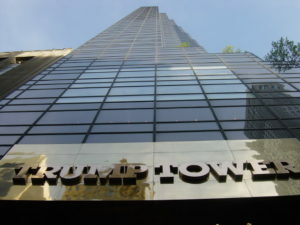 Although the president-elect summoned several of technology’s leading lights to Trump Tower this week for a fet-to-know-you powwow, it was no love-fest, despite Trump’s nominally conciliatory tone. More to the point, Trump’s trade agenda and bellicose posture toward China represents a clear and present danger to Apple, Google, Facebook, Microsoft and the rest. Not only could chilly relations with China freeze them out of that massive market but Silicon Valley is highly dependent on a global supply chain that runs right through the People’s Republic. Technology companies are also vulnerable to charges of off-shoring production of their gee-gaws and undercutting employment in the U.S., a signature issue for Trump during the campaign. Moreover, the close identification of many leading technology companies with their CEOs — Bezos, Zuckerberg, Cook — will make it easier for the thin-skinned and impulsive new president to personalize disputes and retaliate against individual companies, as he’s recently done to Boeing and Lockheed Martin, cratering their stocks. In short, Silicon Valley has a lot to worry about from the incoming administration apart from revising the safe harbor provisions of the Digital Millennium Copyright Act or whether the Copyright Office gains independence from the Library of Congress, and it needs to husband its political capital carefully. If ever there were a time for copyright owners to catch Google on the back foot, now is probably it.